The troll’s putrid stench wafted into the Viking’s nostrils, threatening to make him lose everything he had eaten that day. He clenched his stomach muscles, refusing to let any physical weakness show. There was simply no time for weakness. Weakness is what had killed his companion. That’s fine with you, however, since that leaves the position of village chief open for the taking. In order to do so, you must show the other Vikings your worth, which is no small feat. Protect the town from pillaging trolls while aiding nearby villages from terrorizing draugrs. But in order to show your true worth, voyage across the seas to hunt mythical monsters, including the ferocious dreki. Champions of Midgard is a worker placement game in which players must recruit warriors, manage resources, and fight off villainous creatures before your opponents claim the glory for themselves. The goal of the game is to acquire the most Glory by the end of eight rounds. 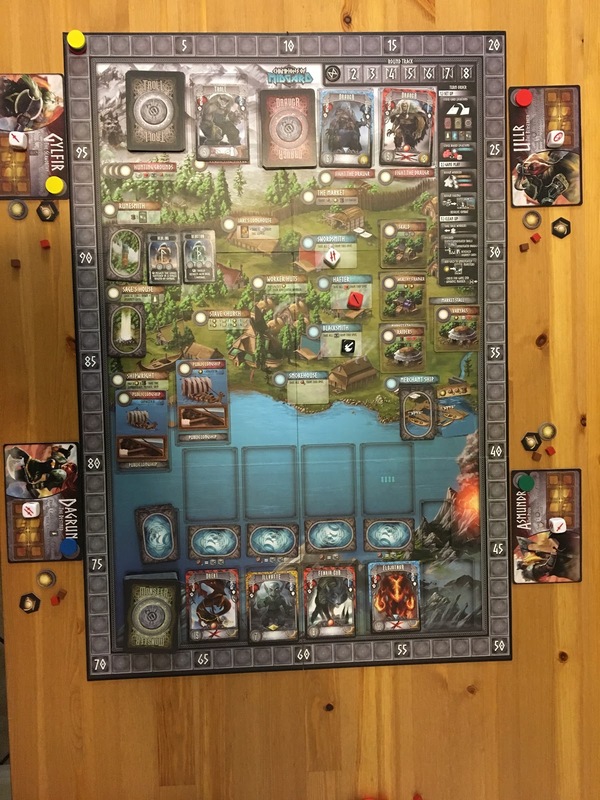 After setting up the board with cards, tiles, and resources according to the setup in the rules, each player chooses a unique Viking leader, complete with his or her own special ability. Each player begins the game with one piece of gold, one honor token, one swordsman die, and a wood and food token apiece. After determining who goes first (which is the last person to gain glory in combat…fight that one out among yourselves), you’re ready to prove your worth. 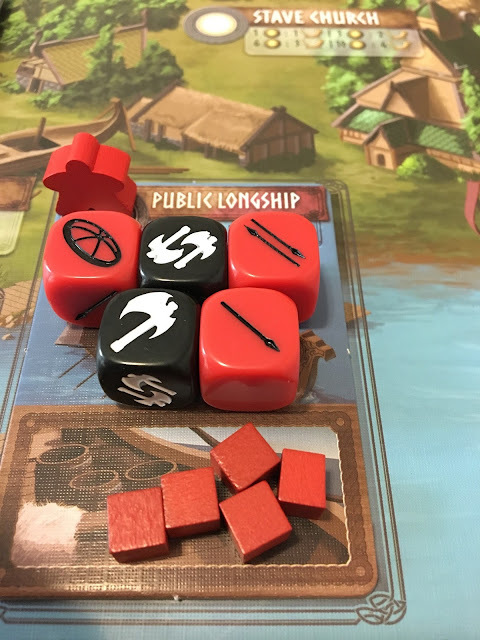 Each game consists of eight rounds, and each round consists of three phases: worker placement, assign warriors, and combat. During the worker placement phase, players alternate in placing one of their worker meeples on different board locations. This is where you collect resources, as well as warriors in the form of dice, who will then be used to fight your battles later on. Once each player has placed their workers and collected any immediate effects, it’s time to assign warriors (dice). Decide how many dice you wish to allocate to each battle location. Some enemies are immune to certain weapons (as indicated at the bottom of their card), so that becomes an important factor to keep in mind. The yellow player will fight the draugr with 2 spearmen, a swordsman, and an axeman. Once you’ve assigned your warriors to the field of battle, it’s time to fight. 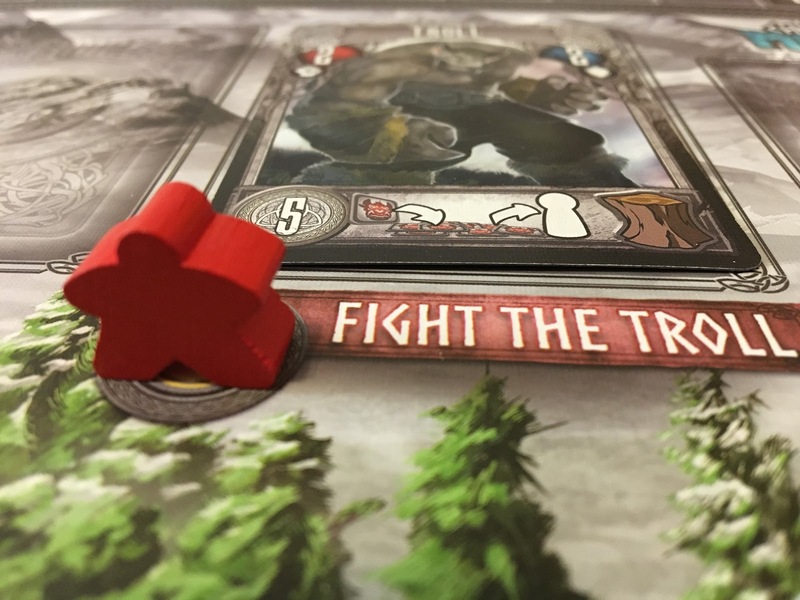 Starting in the upper-left corner of the board (usually the troll, unless someone’s out hunting), players face off against their foe. 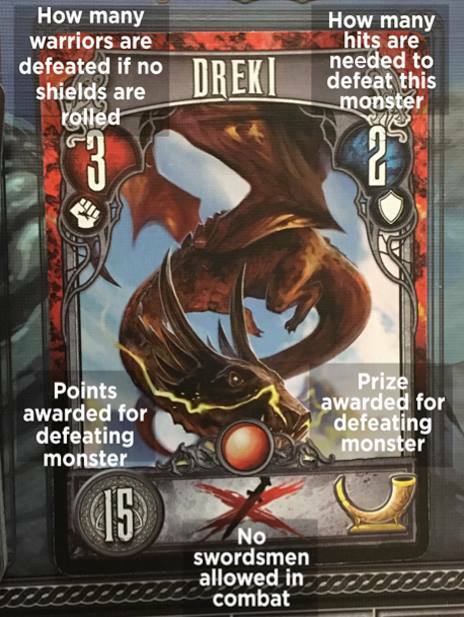 Each creature has an attack and defense number on their card, which tells the player how much attack must be rolled to defeat the creature, as well as how many shields need to be rolled to protect your warriors. Once the beast is defeated, collect its card, move your point marker up the point tracker accordingly, and collect any resources noted on the card. And, of course, bury any deceased warriors (may they find glory in the mighty halls of Valhalla). Things get tricky when the troll comes for a visit. If nobody defeats the troll, each player receives a Blame token, which counts as negative points at the end of the game. If, however, you defeat the troll, you may give a Blame token to one other player (this, I’m sure, is the origin of the term “trolling”). Play continues in this manner for eight rounds, after which scores are tallied and the winner is crowned jarl, chief of Midgard! I love this game. 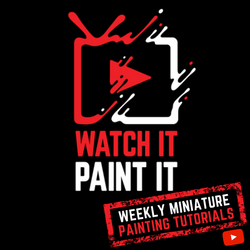 It’s dripping with theme, the battles are exciting, and there are lots of ways to gain glory (victory points), which makes for some very close endgames. 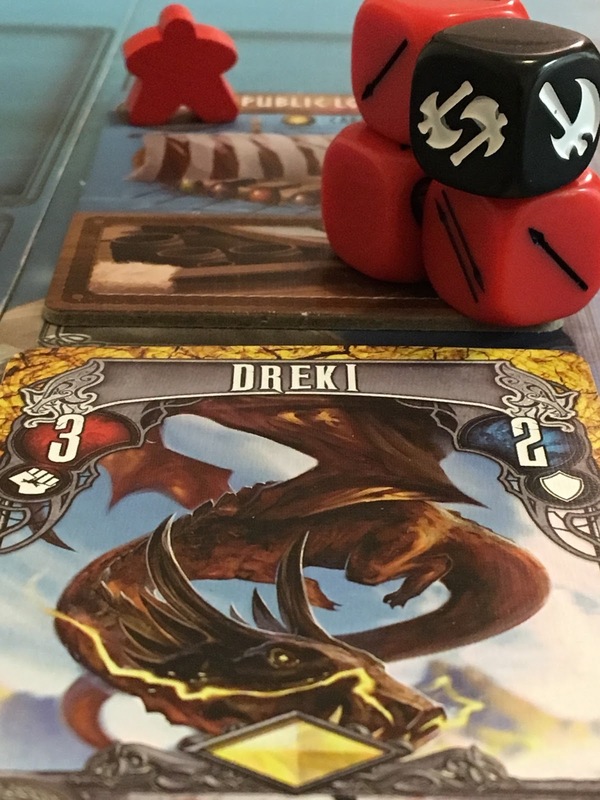 One of my favorite parts about this game are the journey cards, which are placed between you and the monsters across the sea. Sometimes a kraken is waiting to gobble up your warriors, while other (more rare) times, it’s clear sailing. Renting (or buying) a longship and sailing across the seas brings the most glory as far as points go for slaying the monsters, but it’s much more risky than staying on land and defeating a troll or draugr. After all, your warriors need food for the journey, and your ship can only hold so much of it, not to mention the warriors themselves. It’s a gamble, but hey, isn’t that part of the Viking spirit? The components are nothing fancy, which isn’t necessarily a problem unless you like to bling out your games. However, there is an upgrade pack available to purchase to help give shape to your food and wood, rather than having them as simple wooden blocks. The gold, favor tokens, blame tokens, and wound markers are simple cardboard pieces, but they still look pretty good and are easy enough to pick up without fingernails (hey, it’s a thing). My least favorite part is setup, since it can take some time due to all the different decks of cards and resource types. But, it’s nothing too intimidating, and once you’ve set it up a few times, it gets much faster. 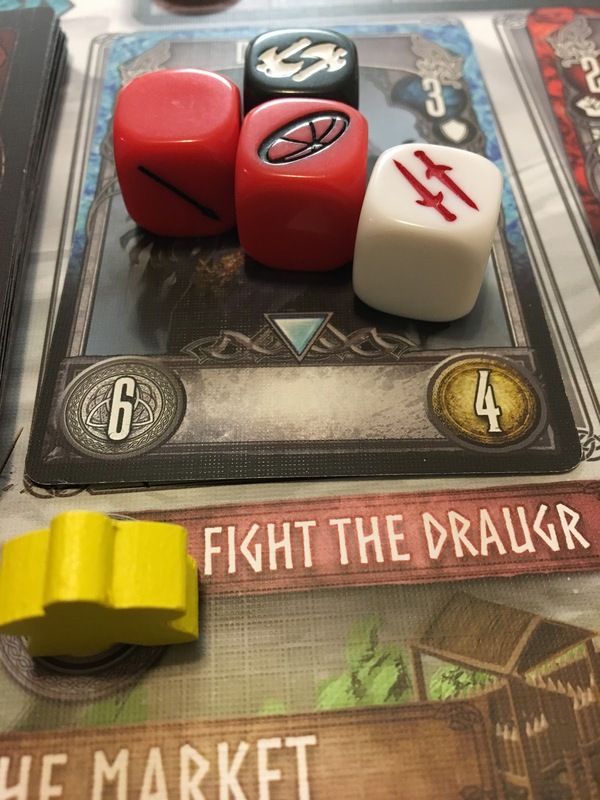 As with most dice games, luck plays a roll. However, there are ways to mitigate that luck, which can be a game changer when your warriors forget how to fight. 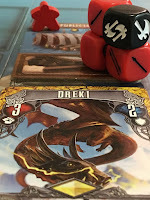 In order to reroll your dice, you need to give up a favor token, which is worth points at the end of the game, so the sacrifice is real. 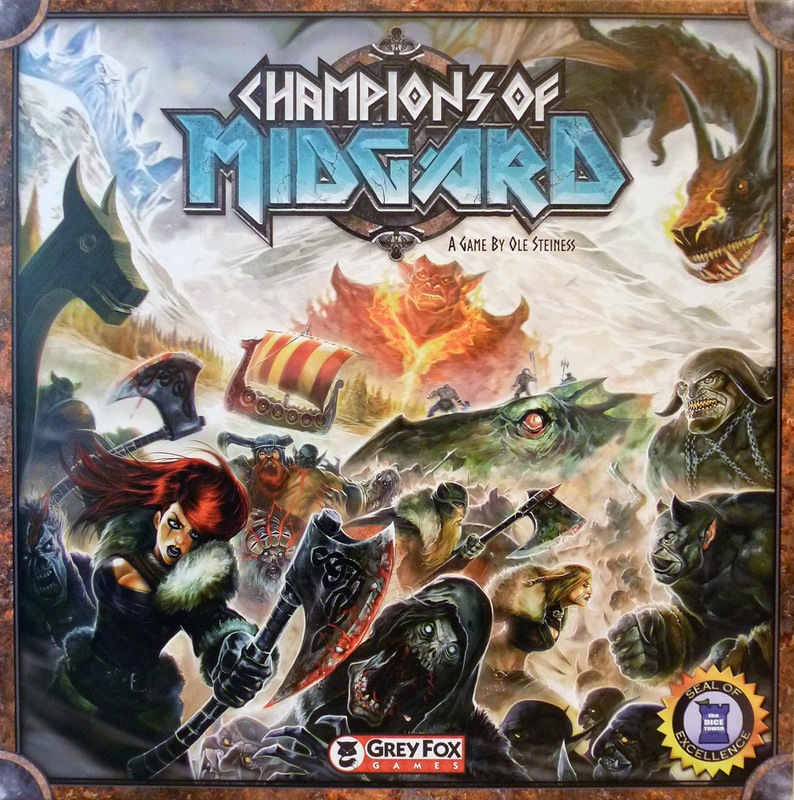 Champions of Midgard may take a bit longer to play on your first go, but once you get the hang of it, it speeds along nicely. 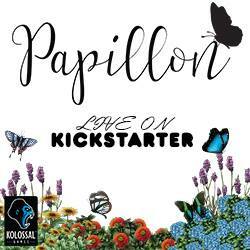 It only allows up to four players, however a new expansion (which just finished its run on Kickstarter) will add a fifth player into the fray. It plays very well with two, which is also a huge plus. In all, I can’t see this game ever getting old for me. There’s just something about cutting my opponents off from the resources they want, while still trying to gain enough for my needs as I stave off pillaging trolls and journey across a vast ocean to hunt deadly prey. 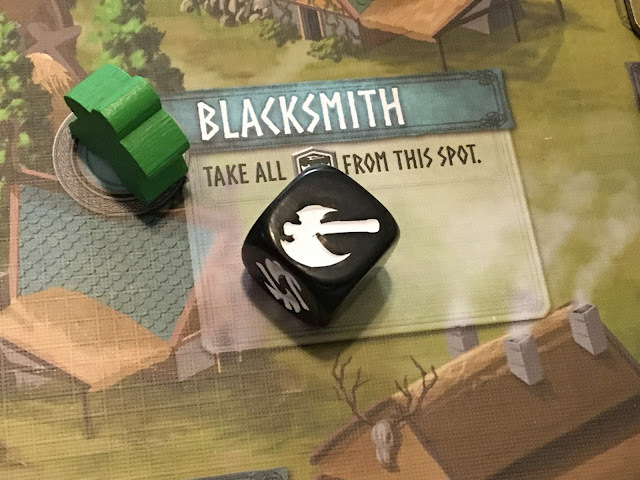 I’ve played Champions of Midgard countless times, and each time I roll my dice, my heart rate shoots through the roof with excitement. Best of all, each game plays out differently, and with the various Leader abilities, strategies change frequently as well. I’m giving Champions of Midgard a 9/10. Yes, setup can take some time, but the gameplay is engaging and exciting, it’s rich in imagination and theme, and I get a rush every time I play it. To be honest, I can’t remember having a negative moment with this game, and I can’t see myself ever turning down an opportunity to play. It’s not perfect, but for me, it’s close enough. If you’re a fan of worker placement games, this one’s for you. For everyone else…well, it’s for you, too.